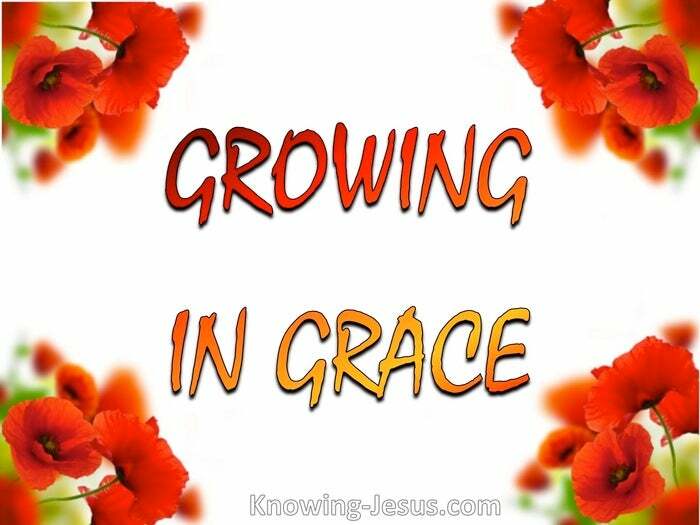 But grow in the grace and gain knowledge of our Lord and Saviour Jesus Christ. God can act in a split second.. in a moment.. in the twinkling of an eye. But in relation to our spiritual maturity – God takes His time. God can miraculously fling stars into space, divide the seas – turn water to wine. But often in a believer’s life He uses the natural to accomplish the supernatural. In the life of a believer God uses a life-span of time to prepare him for eternity, and like the chronology of the world, God uses a lot of time to fulfil His works. A tiny seedling can be placed in a hot-house to force an unnatural spurt of growth, but such artificial progress, early in the life of a believer has disastrous results. The majestic oak takes centuries to be transformed.. from a tiny acorn to mighty tree– and such growth results in strength and stability.. and many, many acorns. But it grows slowly and it looks very insignificant for many decades.. as silently within, the sap nourishes the leaves, the twigs, the boughs and trunk.. while without the raging storms and buffeting winds secure the rooting system. Oh yes God takes time to bring a tiny acorn to maturation as a mighty oak. And God takes time in the life of a believer to bring him to maturity in the faith. But he grows slowly and looks very insignificant for many decades, as silently within the Word of God nourishes the spirit, soul and body – while without the raging storms and buffeting winds of life, develop a trusting faith. It’s interesting to note that mighty oaks have a very brief period of growth. For the majority of time, growth is simply solidification, that is establishing maturity. How much more is this the case for we who are God’s sons,where our life in time is preparing us for eternity. God knows what’s best in the life of each believer to bring him to strong, full maturity – and God takes time to bring a man or woman from new-birth to final maturity, God takes time to conform each of His children into the likeness of His beloved Son. Christ is our perfect example. He took decades to reach the age of maturity. He, the perfect man learned obedience, over many years of insignificant obscurity. Jesus grew in wisdom and favour with God and man – over much time. Jesus could have taught the elders at the age of 12, and yet He simply asked questions. Jesus could have overshadowed the Baptist’s ministry, but He quietly waited – His time had not yet come. So he quietly watched and patiently waited God’s time. Pressure from man nor presumption from within would cause Him to act too soon. He could have identified Himself as an eager prophet, before His appointed time. He could have resisted long years of silent waiting.. proclaiming an ‘early’ gospel – but He accepted that God takes time to carry out His plans in a trusting Son. Throughout Scripture there are examples of men who also had to wait God’s time. Similarly throughout the Church age – saints have been caused to wait on God’s time. Some try to circumnavigate God’s appointed time and seek to sprout too early.. perhaps through gratefulness to God for salvation or presumption of the old sin nature. Perhaps an eagerness to share the gospel without ‘epignosis’, which is a mature faith.. or maybe the flesh. Perhaps a lack taught discipleship or lack of grounding in the truth of the Word – Perhaps by being given ecclesiastical responsibility too soon, which ‘puffs up’. God takes time in a man to bring him to a mature knowledge of His Word. However enthusiastic or deeply committed, God will not modify His growing pace.. often causing dissatisfaction or declension – disappointment or even despair. This is not backsliding as so many consider it, but the Work of God deep within, for all of self must go so that all of Christ can be manifested in the believer’s life. This takes time : more time : much time to produce fruit : more fruit : much fruit. One great saint put it this way:- it is God’s way to set people aside after their first start, so that self-confidence may die down. Thus Moses was forty years and on his first start he had to run away. Paul was three years also, after his first testimony. Not that God did not approve the first earnest testimony. We too must get to know ourselves and that we have no strength. Thus we must learn, (and then leaning on the Lord) we can with more maturity – and more experientially, deal with souls. How graciously does the aged apostle Peter, who failed so miserable put it:- but grow…. grow in grace. 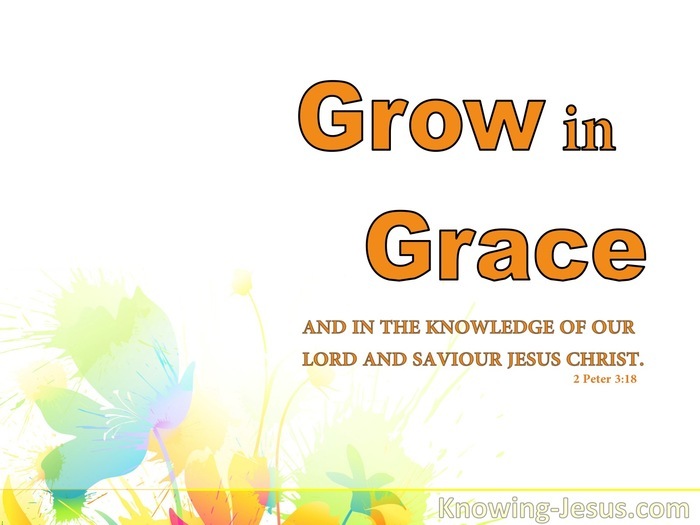 Grow in the grace and gain knowledge of our Lord and Saviour Jesus Christ. To Him be the glory both now and forever. Amen 2 Peter 2:18.